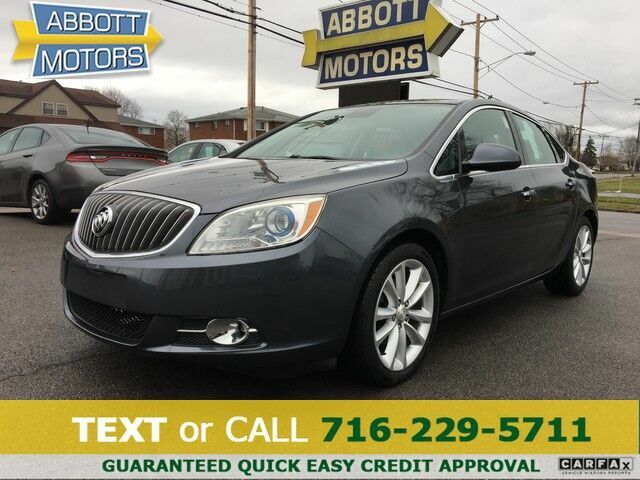 ABBOTT MOTORS, An exceptional car buying Experience, is offering this exceptional Cyber Gray Metallic 2012 Buick Verano w/Leather & Low Miles for sale. This vehicle is loaded with great features, plus it comes with the CARFAX BuyBack Guarantee. Why spend more money than you have to? This Buick Verano will help you keep the extra money you'd normally spend on gas. The incredibly low mileage and painstaking upkeep on this Buick Verano makes it a once-in-a-lifetime deal that won't last long! Call us today to reserve your test drive! Although this 2012 Buick Verano w/Leather & Low Miles is technically a pre-owned vehicle, the clean and spotless interior could fool even the toughest critic. This impeccably built Buick Verano w/Leather & Low Miles comes with a plethora of added features that have made this vehicle a unique find. These options will simply amplify the experience of owning and driving this wonderfully crafted Buick. Added comfort with contemporary style is the leather interior to heighten the quality and craftsmanship for the Buick Verano One of the things that makes this vehicle a great buy is it has a recently replaced set of all season tires. This car has an exceptional paint finish that shows no sign of age or wear. This Buick Verano w/Leather & Low Miles has high-end wheels to enhance your ride and the overall appearance of this vehicle. More information about the 2012 Buick Verano: The 2012 Buick Verano is aimed squarely at the entry-level luxury buyer, and what that buyer gets is a well-built American car loaded with amenities you often have to pay up for to find. When compared to others in the segment, such as the Acura TSX and Lexus IS250, the Verano more than holds its own, yet is priced more than $7,000 beneath the former and $10,000 under the latter. Interesting features of this model are premium luxury features, competitive, entry-level pricing, standard safety features, and Whisper-quiet ride STOP IN TODAY or Apply Online 24/7 at Abbottmotors.com ... All Trade-ins Welcome... Same Day Delivery... Call or Text Today and See The Difference... We Look Forward to Serving You! !This vehicle may be subject to potential open recall(s). Vehicle recall information may be found at Safecar.gov. Please verify price, equipment, options and features with your sales rep before your purchase. We Look Forward to Serving You. *Tax, title, plates extra. All Financing On Approved Credit. BBB accredited A+ member.